Welcome back! So you already know the gist: rogue Time Master Rip Hunter has enlisted a team of your favorite supporting players from Arrow and The Flash to stop an immortal madman called Vandal Savage. Well, their first big encounter with Savage ended badly, with Carter (Hawkman) getting killed and Kendra (Hawkgirl) being seriously injured. Oh, and they are currently unable to leave 1975 due to damage to the Waverider time ship. Well, what to do? Unscheduled Pit Stop. So with the Waverider currently stuck in 1975, they have to contend with: 1) fixing the ship and the shuttle inside; and 2) Kendra’s health isn’t going to make her able to survive another time jump. Speaking of Kendra’s health, its not improving because pieces of that mystical dagger are stuck in her, and pushing closer to her heart. The pieces are too small to be pulled out even by future tech, but one person could do it: Ray with his ATOM suit. Rip puts Jax on repairing the shuttle, and Sara is aware that Rip is a little low on plans on how to proceed. So, she proposes another way to cripple Savage: by destroying his money supply. So Rip sets course for where Savage may have his money, in a German bank. Once there, he decides to investigate the bank with Sara, ignoring Cold and Heatwave’s interest to go on a B&E trip. But Cold does swipe a card or something from Rip, but why, exactly? Dr. Stein is still feigning ignorance on whether Ray was a student of his or not as Ray shrinks himself and is injected into Kendra. Ray does okay destroying the pieces until his crash into a piece causes him to abort the mission. This is gonna take a while. Sing along, everyone: Come along and ride on this….fantastic VOYAGE! Go For The Heart. Rip and Sara arrive at the bank, pretending to have a really big amount of cash to deposit. They get left alone in the bank manager’s office, and Sara tells him to hurry, because she’s been casing the place since they went in and has to come to the conclusion that all the bank employees are not what they appear to be. Well, that and they return to the office with swords and guns. Sara is carrying a few knives on her and starts killing all the baddies, which kind of shocks Rip, like he didn’t know this about her (turns out…). He tells her to leave the bank manager alive, because they still need to find Savage’s money trail, and find something in the manager’s computer mentioning “the vessel”. What is “the vessel”? Back on the Waverider, Jax is finishing up repairs on the shuttle when Cold and Heatwave drop by, wanting to take the shuttle on a little museum robbery, and since Cold stole Rip’s key card, they can. Jax, maybe against better judgment, decides to tag along. Regrets (They Have A Few). At the Waverider, Rip’s asking the thing he probably should have researched earlier (maybe this season of Arrow wasn’t available for him to view at the time), but why is Sara is so bloodlust-y? Well she explains that, and fine, they can both interrogate the bank manager in a holding cell. During the interrogation, the bank robber says from the way Rip refers to Savage by his name, he sounds like “Gareeb”. Who? Well Rip punches the guy and Sara has to ask, what is the guy talking about? It all plays into that opening scene in Egypt where Rip tries to kill Savage: this mission isn’t the first time Rip has tried to end Savage! But the problem was, Rip couldn’t finish him off (not that it would have mattered, considering what we know so far) and clearly isn’t a killer. Well we all can’t be super hot and cold blooded murderers like me, Sara reassures him. Thanks, I think. Ray is back at his makeshift, not wanting to finish the job, because he takes failure REALLY PERSONALLY. Well, Stein doesn’t want Kendra to die because Ray is having is having a emotional crisis, so he tells him he lied about not knowing Ray as a student because of the doc’s ego and that Ray was super-smarter and super-cooler than him. Whatever works, man. Captain Cold Comfort. 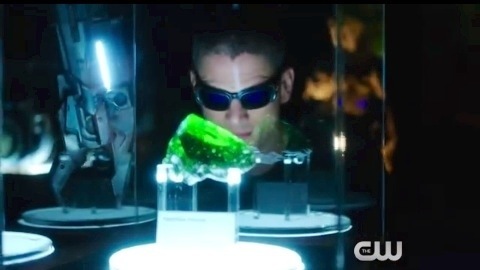 The Waverider shuttle arrives in Starling City, and Cold grabs a specific emerald. Why this specific emerald out of all the stuff there? Because his dad a few days from now attempts to steal the emerald, is sent to prison, and from what we’ve seen from the father/son Snart reunion on The Flash earlier this season, he becomes an abusive jerk to Leonard and his not born yet at this point sister. This has to be a really bad idea. Cold arrives at the Snart house, empty beer bottles and all, and accidentally runs into young him. And here’s where you see Cold tell his younger self (pretending to be a friend of his dad) that he should never let anyone hurt him, and he cries, and you probably just did watching it too. But daddy Snart is awake with a gun at Cold’s head, so young Leonard is told to go back to bed. Cold hands his dad the emerald, knowing that if he has it, he can be bribed into not abusing him and the daughter daddy Snart has not conceived yet! Shush about that, man! Jax says this trip can’t end well for Snart, but Cold’s all, whatever, take us home, wheelman. The Vessel. 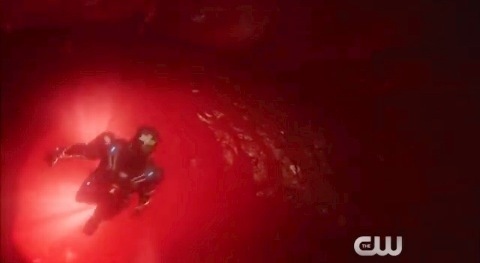 On the Waverider, Rip finally gets info on “the vessel”, in that there’s a meeting with it tonight, and that the “vessel” is the corpse of Carter/Hawkman! Well, Rip won’t stand for that, and when finding out the shuttle is missing (which, not good job, Gideon, not informing your captain about that! ), he wants to go with Sara, without everyone else, to the meeting. So they get into some nice dinner clothes and head to the gala of weirdness using the bank manager as an unveiling accomplice. They stuff the manager into a car trunk, and try to blend into the posh crowd. After a quick dance and survey of what’s going on, sneak off to find Carter’s corpse. Why are they keeping Carter’s body? Well, Savage comes in with his goons and the freed bank manager, and tells them to stick around, because they’ll see for themselves! Just a while earlier, Ray shrinks back and heads into Kendra to destroy the remaining dagger pieces. Well he succeeds, and comes out, his ego boosted back to normal. Ray tells Stein that he just realized the doctor lied about facts regarding being a student he used in his argument to get Ray back on his game, but thanks for the pep talk either way. Then, Kendra starts mumbling some Egyptian (which sounds familiar later on) and that Rip and Sara need help at a hotel. The two scientists learn everyone else is not on the Waverider (REALLY? ), and ring the shuttle, telling Jax, Cold, and Heatwave to head over to the hotel to save Rip and Sara. Blood Feast. So Carter’s corpse is laid up on an altar, and the party guests are in cult robes, as Savage asks the captured Rip why he’s back to kill him after failing the last time over 4,000 years ago. Well, Savage finds a picture of Rip’s wife and son in a pocket watch Rip has, and says if he doesn’t remember killing them, he’ll kill them soon enough. If that isn’t creepy enough, Savage cuts open an artery on Carter’s body, and takes the blood and shares it with himself and his faithful cult members! He’s been sharing the Hawkpeoples’ blood over the years so he can extend the lives of his faithful beyond normal, which, damn. The chanting is what Kendra repeats, and what warns the team to what’s going on. So in bursts Cold, Heatwave, and Jax, and they start fighting the cult and free Rip and Sara. Rip fights Savage, and during the struggle, plunges a knife into Savage’s chest, and dedicates it to his son and wife, which, genius, you now told the clearly can’t be killed by you immortal their names! Good one. Oh, and Sara doesn’t indulge in bloodlust by sparing the bank manager. Funeral For A Friend. 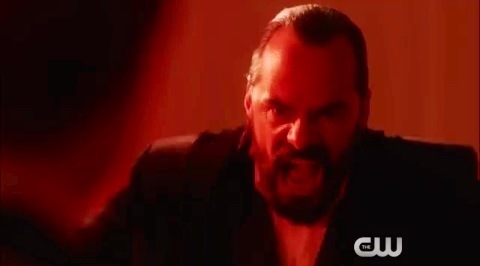 Now, “why they don’t take Vandal Savage, put him in chains, wait until Kendra is up and she can kill him with that dagger?”, you ask. Well…um…anyway the team comes back to the Waverider and find Kendra awake. She’s thankful they recovered Carter’s body, and once she’s back on her feet, they have to train her to hold her own against Savage. Meanwhile, Cold discovers his timeline hasn’t been altered, thanks to the dumb move of his dad trying to sell the emerald to an undercover cop and getting arrested. The timeline tends to correct things. Just ask Cisco about that next time you’re in Central City. So the team gets to go out to a park or something, where they hold a funeral for Carter. It’s the least they could do. With that done, the ship’s repaired and Gideon has managed to find what time period Vandal Savage appears in next: 1986! We’re going to the 80’s, gang! –Comic book connections: Cold has a pretty bad childhood, but unless current DCU continunity has changed it, he never killed his dad as an adult. Also, Rip mentions seeing “men of steel and dark knights die”, which, you don’t need me to tell you who that refers to, right? –Ray brings up his dead wife again, which fine, but wouldn’t his failure to save her force him to double down to save Kendra? –The first person Sara kills with her knives, which she has a lot of on her? The lady baddie. Just saying, no quarter when it comes to women hating on other women. –So how did Rip escape capture by Savage after his failed murder attempt in Egypt? –That CG with Ray flying through Kendra’s bloodstream was really awesome. LOVED the CG in the blood stream!